When making bread it is very important to keep to the correct temperature, as the action of yeast or leaven is very temperature sensitive. 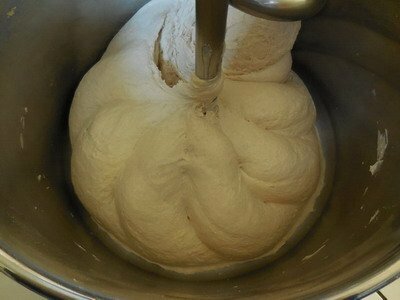 The dough should therefore be warm enough to allow the yeast to multiply and make the dough rise, of course, but not too warm, or this will have the opposite effect. To express this ideal temperature for the dough, rather than saying, “the dough should be at 24°C”, for example, bakers talk about the basic temperature. This is used in a calculation which takes into account the room temperature (in their bakery or our kitchen) and the temperature of the flour. This gives the temperature at which the water (known as “process water” in commercial bakeries) needs to be, for that particular recipe, when added to the flour. 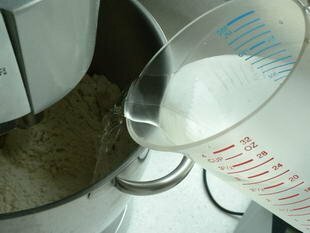 The main thing to remember is that the temperature of the water (or milk) added to a bread dough is very important. This is specific to the particular recipe and it should be calculated every time. The basic temperature is always stated for every bread or “viennoiserie” recipe on this site. 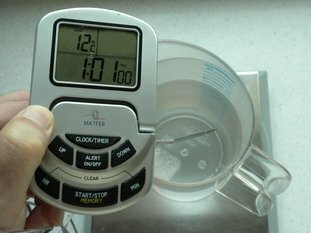 If it is 20°C in your kitchen, the flour is at 18°C and the basic temperature of the recipe is 54°C, then what temperature does the water need to be at? Easy, isn't it? You might be surprised by some of the temperatures recommended and find them rather on the cool side. However, this is a bakers' trade secret that it is well worth knowing. The temperature is fairly precise, but not to within a degree or two, so the temperature is often given as a 4°C range, such as 54 to 58°C. This will give you a similar range for the water temperature: 16 to 20°C in our example. But, in any case, all bread recipes on this site which use a basic temperature have a little automatic calculator to do the work for you. All you need to do is enter the flour and kitchen temperatures. How do I get the water to the right temperature? You will have already guessed by now that you will need a thermometer, as you need to adjust the water temperature just before adding it to the flour. If you need the water to be hotter, I suggest you boil a little, tip ¾ of the water needed at room temperature into a jug, then add very hot water to make this up to the right volume at the right temperature. If you need the water to be cooler, I recommend putting some water in the fridge the day before. Then, on the day, put ¾ of the quantity of cold water into a jug and top up with tepid water to the correct volume and temperature. You can also use ice cubes if you have forgotten to put the water in the fridge beforehand. You can try a bread recipe or Viennoiseries (sweet breads, buns).